[During the Spanish-American War] cinema had found a role beyond narrow amusement, and this sudden prominence coincided with a new era of overseas expansion and military intervention. Who can say what fantasies of power audiences experienced in those darkened halls, and how these emotions continued to resonate outside the theater? (261). Although it is not within my purview to provide definitive answers to Musser's vexing question, in this article I contribute to an underveloped area of film studies by exploring the ways in which early film intertextually inscribed ideologies of race, gender, and imperialism during the first American war exhibited on film to the U.S. public. 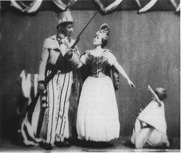 To offer a brief example, Edward Amet's allegorical tableau film Freedom of Cuba (1898) is particularly instructive for what it reveals about American attitutes toward imperialism and the Spanish-American War. Indeed, the mise-en-scène literally infantilizes Cuba by showing a baby dropping a Cuban flag and reaching out to accept its beneficent protectors. This thematic became a central trope in imperialist rhetoric during the war, exemplified by Rudyard Kipling's "White man's burden" to protect and educate his "uncivilized" little (brown) brothers. In addition to analyzing several Spanish-American War films, I also venture outside the film "texts themselves" to explore the reception of Spanish-American War films in several regions. By drawing from newspapers in Massachusetts, Wisconsin, Indiana, Georgia, and South Carolina, I construct various contexts--regional, historical, political, theoretical, intertextual--in order to examine the ways in which film and other media contributed to the cultural production of the Spanish-American War. My research demonstrates that the mediation of the Spanish-Amercan War poses important theoretical and historical challenges to existing literature concerning early cinema's public sphere, while also exposing the methodological limitations of certain strands of film and cultural studies scholarship. See also Navigating the Article and Viewing the Films.